A great phone by Nokia at this price point. The build quality is far ahead of any of the competitors. Overall, the phone has clean looks and a near stock android like the google pixel. The performance is good and overall recommended at this price range. The upgraded version of Nokia 6 comes with a lot of improvements. Sadly, it still has thick bezels on the front. The software is optimised giving you amazing user experience and battery life. The cameras now click good shots as compared to the previous Nokia 6. Overall, it is a great device. If you want to taste stock Android with a pinch of amazing build quality then this is what you need. 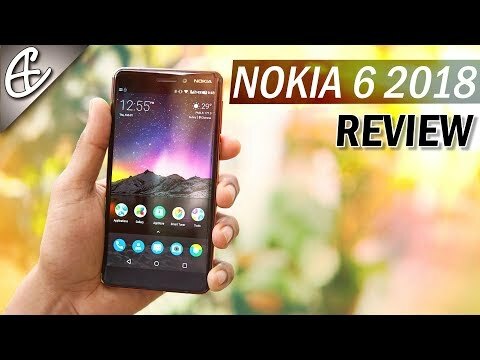 Nokia 6 is a great smartphone. I love the awesome build quality and the device feels very premium in the hand. The stock Android is very stable on the phone and I get all the software updates on the time. I love this thing about Nokia. Nokia is the best brand no doubt and their customer support proves that. Must buy if you want to invest in a good experience. 4 Pricebaba users have written their experience with Nokia 6 2018. If you own Nokia 6 2018, please do leave your feedback too. Lowest price of Nokia 6 2018 price in India starts at Rs. 10,899 Nokia 6 2018 is available on Flipkart at Rs. 10,999 and on Amazon at Rs. 10,999. Prices updated on 19th April 2019. The Nokia 6.1 boasts a 5.5-inch LCD screen having a resolution of 1920 x 1080 pixels. A Corning Gorilla Glass 3 is fitted on the top of screen for protection against accidental damage and scratches. The Nokia 6 (2018) does not feature a bezel-less display. Design-wise, this variant is different from the older one. The physical home button and capacitive navigation keys have been eliminated. The fingerprint scanner is now located on the rear. This phone sports a USB Type-C connector for charging. A 3.5mm headphone jack is provided for using earphones. Sensors on the phone include accelerometer, magnetometer, gyroscope and proximity sensor. The device ships in a Black color variant. As far as cameras are concerned, the Nokia 6 (2018) has a 16MP primary snapper with PDAF system accompanied by dual tone LED flash. Upfront, it has a 8MP sensor for your selfie needs. The camera software has various features like digital zoom, high dynamic range, exposure compensation, continuous shooting, ISO control and face detection. The rear camera offers Full HD video recording (1080p). On the hardware front, the Nokia 6.1 is powered by a 2.2GHz octa-core Snapdragon 630 processor. It packs 3GB RAM and Adreno 508 graphics processor onboard. Performance-wise, this phone runs smoothly and free from any lag. For storing data, you will get 32GB internal storage which can be expanded up to 128GB via its microSD card slot. Out of the box, the Nokia 6.1 (2018) runs on Android 8.1 Oreo operating system. The Nokia 6.1 runs on a non-removable 3000 mAh battery. It comes with fast charging feature which is capable of charging 50% battery in 30 minutes as well. The device offers dual SIM slots and will support nano-SIM cards. Connectivity options on the phone include 4G LTE, 3G, 2G, WiFi, Bluetooth, NFC, and VoLTE. 1.Will this support my existing Nano SIM card? Ans: The Nokia 6 (2018) requires Nano SIM card and thus will support your existing nano sim card. Ans: Yes, a hybrid SIM slot means you can insert two SIM cards or one SIM and a microSD card. Ans: A 8MP front camera gives you great selfies. Ans: For charging, you will need a USB Type-C connector.